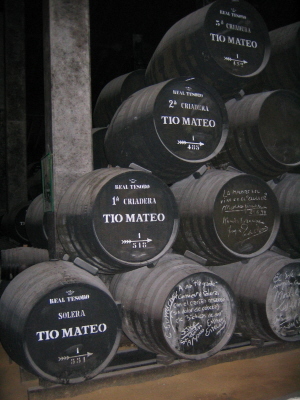 Solera y Criadera method is used for aging of spirits in casks, very popular in Portugal and Spain for the production of Port wine and Sherry respectively, but even for alcoholic drink as Rum and Marsala. The method consists in arranging barrels into superimposed rows, starting to fill only the high barrels; after a year one part of the content is decanted into barrels that were located at the lower level and the upper ones are filled with the new wine or distilled. The process is renewed from year to year, so that the drink in barrels at the base ready to be consumed is composed of products of different vintages, that contribute to give it a distinctive flavor. A solera is literally the row of barrels placed in the bottom, where alcoholic beverages are more aged, while a criadera is the row placed in the top of the pyramid, where alcoholic beverages are younger.